When an academic, or student, thinks they have found a mistake in an academic paper or book, what do they do? Check their calculations again and again, or course. Ask someone else to do the same, maybe. But then they will write to the authors of the original work, and ask them to comment. What they will not do, in that letter or email, is to give the original author a deadline of one day to respond. That was how much time Chris Giles of the Financial Times gave Thomas Piketty to respond to his long list of alleged errors and unexplained adjustments. I also get very cross with academics who suggest that, because his book had become a bestseller and he had accepted invitations to talk to White House staff, he somehow deserved this kind of treatment. This seems to me like hypocrisy at its worst. Given this treatment, both Thomas Piketty’s initial response and his more detailed response issued yesterday are remarkable and impressive in their restraint. It is worth noting that if we look at the Atkinson and Morelli database, among the six European countries where there was recent data for the top 1% wealth share, I counted three where there seemed to be an upturn in wealth inequality over the last few decades, and three where data showed no clear trend over the same period. Chris, in a first response to his critics, says that “Academic economists have got themselves into a bad spot if undocumented data, errors and tweaks are considered by some acceptable research practice.” As my original post pointed out, the best academics make mistakes, although in this case it is not clear any were made. So do the best journalists, and at the end of that post Chris acknowledges one of his own. If you want academic research in economics to scrupulously document every detail, you will either get a discipline that is so narrow as to be useless, or you will have to give academics a lot more resources! In a previous post I argued that high house prices, in the UK and perhaps elsewhere, could simply reflect lower expected long term interest rates. This had some people puzzled, because it appeared to ignore supply and demand. Surely it is higher demand combined with inelastic supply (supply that is insensitive to changes in prices) which is to blame for high house prices? This short post clarifies how both views can be correct at the same time. I also raise a question about housing wealth and inequality at the end. The easiest way to think about this, at least for me, is to imagine no one owned their own home. Everyone rents, and houses are owned by landlords. Rents represent the price of ‘housing services’, which is the flow of benefits we get by having a roof over our head. If we calculate these rents in real terms, we have the relative price of housing services compared to other goods. Real rents will reflect the supply and demand for these housing services. If we all suddenly decided we wanted to rent a house in the countryside as well as our house in the city (or vice versa), and if the supply of houses did not increase, rents would rise dramatically until enough of us thought that maybe this wasn’t such a good idea after all. Suppose real interest rates fall, but the supply of housing is fixed. There is no particular reason why lower real interest rates should change the demand for housing services relative to other goods. Then with no change in demand or supply, rents do not change in real terms. But house prices will, because they are - to use a bit of jargon - the present discounted value of future rents, where the discount rate is the real interest rate. This is a shorthand way of saying that lower interest rates mean that investments in financial assets yield lower returns than the same amount invested in housing, so investors will want to own houses rather than financial assets. This pushes up house prices until the rate of return on both types of asset are equalised. That assumes housing supply is inelastic, which is a reasonable assumption in the short term. However suppose by some means (economic or political) these higher house prices generated an increase in the supply of houses to rent. If the demand for housing services is unchanged, greater supply will begin to push down rents. Falling rents push down the yield from owning housing assets. As a result, housing becomes less attractive as an asset, and prices begin to fall. So if housing supply was very elastic, permanently lower real interest rates need not lead to higher house prices in the long run. Instead, they could produce much lower rents, because a lot more houses get built. Such an outcome seems unlikely in a country like the UK, but it could happen in a country like the US where there is plenty of land available to build on. This is one possible reason for the different trends in house prices in different countries that I commented on in my previous post. So my original post was certainly not suggesting that increasing housing supply would have no impact on prices. What it was suggesting was that in evaluating whether current prices represent a bubble, we need to allow for the possibility that high prices today reflect a view that real interest rates may stay low for some time. If interest rates do stay low for some time, and this does keep house prices high, an interesting question is why this matters. Take the case where everyone rents. Rents are unchanged, so those renting are no worse off. Landlords appear richer, but their future income in real terms has not changed. If people own their own houses, their houses have not suddenly got bigger or better. This is related to, but is not quite the same as, a question recently raised by Chris Dillow. It is different because it potentially applies to anyone who owns assets that get more valuable simply because interest rates fall, and not because the future incomes they generate increase. It is the same issue that is raised when some complain that Quantitative Easing, by - say - raising share prices, is benefiting the rich. I think this change in wealth does matter, as this evidence suggests, and I hope to explore the reasons why in a future post. I have written in the past that I have no idea how large the state should be, so this issue has no bearing on my views about austerity or fiscal stimulus. In this post I explain why I have no idea. My argument is that the optimal private/public split will depend on a number of particular and highly contextual issues, about which economics will have a lot to say but where it is unlikely to generally point in one direction. It seems worth making this - I hope uncontroversial - point when the current UK government seems keen to privatise or outsource by one means or another so much of the public sector. There are two claims about government often associated with those who argue in favour of privatisation. One is that markets provide a better allocation system (e.g. here, and follow-ups here and here). For many activities this is undoubtedly true, particularly where markets involve a large number of buyers and sellers, and information problems are small. However much public sector activity is in areas where market imperfections and informational problems of various kinds are endemic. In that situation, market based systems may perform worse than alternatives: a comparison of health systems in the UK and US is an obvious example (e.g. here). The simple fact that large corporations exist could illustrate potential problems with markets as an allocation mechanism. Large corporations may exist because they find it more efficient to organise activity in a non-market (often hierarchical) manner, or they may exist because markets can be circumvented by rent seeking, or they may exist because of increasing returns. This means markets can be fragile or inefficient. Economics is not a discipline that tells us market allocation is always best, but one that tells us when it may work well and when it may not. In reality privatisation or contracting out often involves relocating some activity from government bureaucracies to corporate bureaucracies. George Monbiot argues that we are seeing power gradually shift from the former to the latter. The second general argument in favour of this shift is that the profit motive provides an effective incentive system for ensuring efficiency. Yet this argument alone is not enough. It is perfectly possible to run parts of government like a company, where the explicit aim is to maximise profits. Take the East Coast mainline rail company in the UK, for example. It has been running as a publically owned company since 2009, after the private company running the franchise got into difficulties. It appears to have been run very successfully under public ownership, but the government wants to return it to the private sector. The motive does not appear to be pressure from the public or customers. The complete argument for preferring private sector rather than public sector bureaucracies is that shareholders are better at ensuring managers maximise profits (and therefore efficiency) than politicians. In fact the argument has to be stronger than this: the gain in profitability has to exceed the cost of diverting some of those profits from the public to shareholders. Again I think in many cases this will be true, particularly if checks within government are poor and corruption widespread. However, control by shareholders may be far from ideal, as the recent debate in the UK about the proposed takeover of AstraZeneca by Pfizer has illustrated: see this article by Martin Wolf for example. One argument that has been made in this debate is that shareholders may be unable to prevent managers focusing too much on the short term, because that enables them to expropriate a share of the surplus in excess of their marginal product. Shareholders’ ability to directly control managers appears weak, and the takeover mechanism itself seems highly ineffective at punishing inefficiency. Martin Wolf argues that the real purpose of shareholders is to provide insurance against unexpected shocks that could otherwise lead to bankruptcy. The process of tendering for the outsourcing of services paid for by the public sector allows periodic pressures for efficiency. However often the contracts involved are very complex, and so they also provide an opportunity for firms to exploit the inexperience of the civil servants who represent the public. Finally if we want those undertaking public activities to be accountable as well as efficient, then it is not obvious that outsourcing is helpful. What this all suggests to me is that the costs and benefits of privatisation will vary from case to case, and that this is an area where microeconomic analysis will be central. (For example, see this book by Massimo Florio which looked at the results of the Thatcher privatisations.) In such cases, an ideology that says that the private sector is always better (or worse) is not only unhelpful but dangerous. For example, an ideology that says that private sector provision is always better can be exploited by rent seeking firms. It can lead governments to privatise on unfavourable (to the public) terms, or with inadequate mechanisms in place to ensure value for money and prevent exploitation. At worst, rent seeking firms may be able to exert sufficient control over the political process to make this happen. Given that my area of expertise lies elsewhere, you might have expected me to consider a macro argument that is sometimes made for privatisation, which is that it can help bring down public debt. This is either a terrible argument all the time, or just most of the time, but which will have to wait for a later post. My guess is that the majority of pieces of empirical work by economists will contain at least one error somewhere. Errors become almost inevitable when large and diverse data sets are involved, like those constructed by Reinhart and Rogoff and Thomas Piketty. So finding these errors is not headline news. Nor, for this reason, is it particularly embarrassing for the economists concerned when these errors are found, particularly if they have made their data public or available to others. If you think that shows up empirical economists in a bad light, the best economic theorists can also make errors. One celebrated paper from my youth, Does Fiscal Policy Matter? by Alan Blinder and Robert Solow, contained an algebraic error (pdf). And if you think this shows up all economists, probably the most famous mathematical event of the last few decades - the Andrew Wiles proof of Fermat’s Last Theorem - contained what a journalist would call an error in its original form. It is also often necessary to adjust data for a number of reasons. In an ideal world each adjustment would be carefully documented, but they rarely are. Of course official data series often involve many similar adjustments before they are published. If you can, it is always a good idea to talk to the statisticians involved in constructing your data before you use it, although it can put you off doing any empirical work ever again! Errors and adjustments only matter if they influence key results. The Blinder and Solow algebraic error was not critical to the main results in their paper. The gap in the original Andrew Wiles proof was critical, but after what must have been an agonising year, he found he could bypass the problem and the revised proof was sound. The Reinhart and Rogoff spreadsheet error had a relatively minor impact on its own - the really important issues lay elsewhere. With all this in mind, I have very mixed feelings about Chris Giles’s Financial Times splash. I applaud a journalist who is unwilling to take academic results or official figures on trust, and is prepared (and I guess has the resources) to get their hands dirty with data. Chris has consistently done this. For example, when David Cameron claimed mysteriously that George Osborne’s first austerity budget would increase public sector employment compared to Labour’s plans, Chris got to the bottom of how this trick was achieved. Yet I groaned when reading his latest FT article, with its emphasis on “mistakes and unexplained entries”. As far as I can see (read Ryan Avent here, and the longer Chris Giles post here, and Jonathan Hopkin here), the only issue of substance involves trends in the UK wealth income ratio, but of course an article headlined ‘Data sources on UK wealth income ratio differ’ would not have had the same punch. Now you might say, as journalists always do, that people who become famous - including economists like Reinhart and Rogoff or Piketty - have to accept having their work treated in this way. They become ‘fair game’. I actually think that is wrong. Misleading reporting and commentary - by journalists or bloggers - is what it is: misleading. The fact that it can be commonplace does not excuse it. I understand the temptation to hype up simple spreadsheet errors even when they have no significant consequence, but I’m glad to say I did not succumb to this temptation in the case of Reinhart and Rogoff spreadsheet affair. It is perhaps worth noting one other point. The Reinhart and Rogoff affair became notorious because governments had used this work to justify their austerity policies. The spreadsheet error was brought to light as a result of work by academics rather than by any journalist. In the case of Piketty, no policies have yet been implemented using the results in his book as justification. In that rather important sense, the two stories are different. Whether this asymmetry reveals anything of interest I will leave you to judge. In recent posts (e.g. here) I have been rather pessimistic about what might happen the next time we have a large negative demand shock that puts interest rates to their zero lower bound (ZLB). In theory fiscal policy can come to the rescue, and we can avoid a severe recession. But many of the reasons that did not happen this time persist. The political right will see rising debt as a chance to shrink the state. The financial sector will argue a funding crisis (the ‘bond vigilantes’) are just around the corner. Central banks will do what central banks have nearly always done: advise either privately or publicly that we need fiscal restraint. We can hope that, as recent lessons are learnt, economists speak with more of one voice on what should happen. I like to think this will occur to some extent, as the influence of the anti-Keynesians fades, but the importance of ideology in the discipline is such that economists will never be united on this issue. And in any case, will the majority of economists have more influence than the financial sector and the central bank? I think not, particularly if there is another Greece. Suppose, for the sake of argument, that the fiscal rule involves some target for the deficit in five years time. A negative demand shock hits, and the central bank judges there is more than a 50% chance that interest rates could end up at the ZLB. At that point, the deficit target would no longer apply. Instead the central bank and fiscal council would be obliged to cooperate in formulating a fiscal stimulus package that would enable interest rates to rise just above this lower bound. Both institutions would then recommend this package to the government. The central bank and fiscal council would continue to cooperate in this way (suggesting modifications to the package as new data became available) until the central bank expected interest rates to rise. Call this the ZLB procedure. Why do we propose cooperation between the central bank and fiscal council? The central bank should be involved for four reasons. First, they probably have more resources working on short term forecasting. Second, they could help design a package that was effective at raising demand, rather than one that pandered to political preferences. (Fiscal councils on their own would be wise to avoid making judgements about how deficit targets should be achieved.) Third, a government would find it difficult to go against these two institutions acting together. Forth, the central bank would also probably want to implement some form of unconventional monetary policy, and the size of any fiscal stimulus would need to allow for that. Now you could say that a central bank would be reluctant to make this call, for the reasons I gave at the beginning of this post. However, the central bank bears responsibility here. If interest rates did go to zero, they will clearly have made a mistake, and can be held accountable for that. And once interest rates had hit the lower bound, the ZLB procedure would operate anyway. Why should the fiscal council be involved? Because part of the package would be an assessment by the fiscal council of what should happen to deficits and debt once interest rates did rise above the lower bound. The previous deficit target would have to be revised. A government that accepted the stimulus package would be asked to sign up to meeting any new deficit target after the recession was over. This ZLB procedure should be part of any ‘fiscal rule’. This may seem odd, because it is really an account of how the normal rule should be suspended and what should replace it in ‘exceptional’ circumstances. Why not instead simply say that the normal rule should no longer apply when interest rates hit the ZLB and leave it at that? The reasons are those given at the start of this post. Making up policy in a crisis is fraught with dangers, and macroeconomic rationality can easily give way to vested interests and biases, as we discovered in 2010. The whole point of fiscal rules and fiscal councils is to overcome those interests and biases, and they apply at least as much in a crisis as in normal times. A follow-up to my last post. The US growth recovery began in 2010 and has been sustained, albeit at a modest pace. The UK recovery did not really begin until 2013, but growth may be quite rapid in 2014. So will it be the Eurozone’s turn in 2014? Furthermore, just as UK growth this year can be quite strong because we have a lot of catching up to do from the lost years of 2010-12, will Eurozone growth also be rapid as it has two recessions (2012 as well as 2009) to recover from? The chart below suggests perhaps not. It shows household savings rates in these three areas, and also Spain. Focus on the changes. During the 2008/9 recession we saw increases in savings everywhere, as we might expect after a financial crisis. In the US and UK savings stayed high until 2013. The 2013 recovery in the UK is all about the subsequent decline in the savings ratio. Once again, this is what you might expect after a financial crisis: a prolonged period of high savings as borrowing is gradually reduced and wealth positions restored, followed by a boost to demand as savings rates are normalised. So can we expect the same dynamic in the Eurozone in 2014 and beyond? The answer is probably not, because the decline in the savings ratio has already happened. In fact it seems to have happened earlier than in the UK or US. There is one obvious explanation for this, again straight out of the Keynesian playbook. Unlike the financial crisis, the 2012 Eurozone recession was a recession caused in large part by fiscal tightening. And as basic macroeconomics tells you, if the public sector decides to save more, the private sector has to save less. The Eurozone appears to have already had its growth boost from declines in the savings ratio: it helped moderate the size of the 2012 recession. This also means we do not know to what extent consumers’ financial balances in the Eurozone have been restored: savings may have fallen in 2010/11 not because any correction was complete (as we hope is the case in the UK and US by 2013), but simply because incomes fell. So for 2014 and beyond, the impetus for recovery may have to come from elsewhere. The pace of fiscal tightening may ease, but it is still a drag on growth. Growth in the UK and US will help, but this may be offset by a decline in the rate of growth in emerging markets. Is there anything else that could provide the basis for a strong recovery? Paul Krugman is fond of saying that since the financial crisis, basic Keynesian economics has performed pretty well. Increases in government debt did not lead to rising interest rates. Increases in the monetary base (QE) did not lead to rapid inflation. But these are not the only places where Keynesian economics works. Keynesian analysis tells us almost all we need to know to understand what has happened to the Eurozone since its formation. Some people are fond of denouncing mainstream economics because it failed to predict the financial crisis. But the nature of the Euro crisis was predicted by standard Keynesian open economy macro. The big problem with a monetary union was that countries could be hit by asymmetric shocks, and would no longer have their own monetary policy to deal with them. Many economists, myself included, said that this problem needed to be tackled by an active countercyclical fiscal policy - again standard Keynesian analysis. This advice was ignored. What those using Keynesian analysis did not predict was the shock that would reveal all this: that the financial markets would make the mistake of assuming country specific risk on government borrowing had disappeared once the Euro was formed, which helped lead to a substantial and rapid fall in interest rates in the periphery. But once that happened, Keynesian economics tells the rest of the story. This large monetary stimulus led to excess demand in the periphery relative to the core. 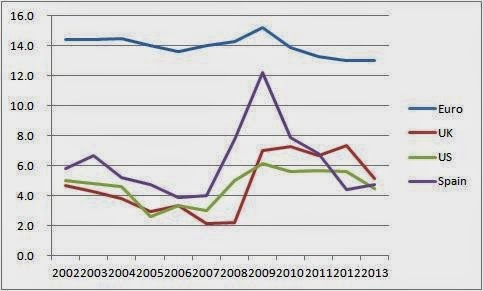 This in turn raised periphery inflation relative to the core, leading to a steady deterioration in competitiveness. This boom in the periphery was not offset by fiscal contraction. Instead the public finances looked good, because that is what a boom does, and the focus of the Stability and Growth Pact on deficits meant that there was no pressure on politicians to tighten fiscal policy. Eventually the decline in competitiveness would bring the boom to an end, but a standard feature of quantitative Keynesian analysis is that this corrective process can take some time, if it is fighting against powerful expansionary forces. So Keynesian economics said this would end in tears, and it did. The precise nature of the tears is to some extent a detail. (If you think the Eurozone crisis was all about fiscal profligacy rather than private sector excess, you are sadly misinformed.) Of course Keynesian economics could not have predicted the perverse reaction to the crisis when it came: austerity in the core as well as the periphery. It could not have predicted it because it was so obviously stupid given a Keynesian framework. But when general austerity came, from 2010 onwards, the implications of Keynesian analysis were clear. Sure enough in 2012 we had the second Eurozone recession, helped along by some perverse monetary policy decisions. Paul Krugman also tends to note how most of those who bet against Keynesian predictions on interest rates and inflation after 2009 have yet to concede they were wrong, and Keynesian analysis was right. The bad news from the Eurozone is that this kind of denial can go on for fifteen years (and counting)! But there is a reason why we teach Keynesian economics - it works. Now even raising this question sounds rather radical, and potentially paternalistic. Should we stop people reading what they want to read, because we think it would be good for them to read something else? The problem with political bias is that it covers a multitude of sins. At its most innocent, it can simply be presenting facts within a political or ideological context that matches that of the reader. In the UK, a lot of the reporting in the Guardian, or Telegraph, is of this kind. Where it gets more difficult is when this bias determines which facts get reported. Take this report in the Daily Mail about the UK food banks run by the charity the Trussell Trust. (Or, as some government sources apparently like to describe the Trust, as a ‘business’ seeking publicity.) It is written as an expose, designed to give you the impression that the numbers of people using the Trust (almost a million) should not be taken at face value. It might just work, for someone who wants to avoid the implications of such a large increase in the use of UK food banks. Anyone with a different perspective would either laugh or get angry. (When the article was highlighted on twitter, donations to the charity increased.) You can spot one or two untruths: a headline says their reporter got three days of food ‘no questions asked’, when the article makes clear questions were asked. But mainly this article is biased because of its highly selective choice of facts presented. The traditional view is that slanting news and a highly selective choice of facts is tolerable, but making things up is not. The idea here is that people read newspapers on the understanding that they are based on facts rather than fiction, so including news stories that are made up is the equivalent of misreporting the sugar content on the packaging of some food. So the only thing that should worry us here is that whereas the manufacturer of a food product would presumably be subject to a large fine and damaging publicity if it got its food labelling wrong, a newspaper can effectively get away with it. Yet this distinction does not address Greg Mankiw’s concern. If people are only told the facts that they are comfortable with, they will never change their minds. And as Paul Krugman observes (via Mark Thoma), if it is only the media read by your political opponents who will cry foul, politicians who just want to ‘play to the base’ are tempted to also distort or manufacture evidence, perhaps leading to descent into a world of fantasy. So this is an important issue. But can Mankiw be rescued from the charge of paternalism? (No, I never expected to write that line either.) I just want to raise two final thoughts. First, do we know that people are happy not to be told important facts that they might find challenging? If they had a choice between a newspaper that presented all the facts from their own ideological perspective, and another identical paper which only gave them the facts they wanted to hear, would they really choose the latter? Perhaps people do not get that choice. Second, even if they might sometimes choose the latter option, do they want that option? Perhaps it is a bit like being on a diet. We know we might be tempted never to be confronted with facts that challenge our priors, but we know we really should be. So just as those on a diet would rather not be constantly faced with the choice of lots of fattening foods, so perhaps people would not object if they did not have the option of just hearing what they wanted to hear. When it comes to the issue of when interest rates should start rising, one of the points I and others have often made is that the risks are not symmetric. If inflation starts rising faster than we expect monetary policy can quickly respond. Alternatively if we actually have more ‘spare capacity’ than we currently believe, it may take some time for this to become apparent (inflation is more sticky when it gets low), and the zero lower bound limits what monetary policy can do. In this light, the following table from the Bank of England’s inflation report issued today is rather interesting. 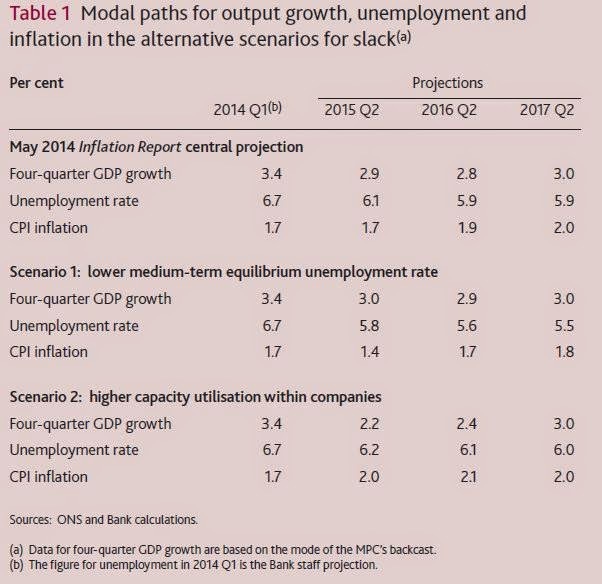 In scenario 1, there is more slack in the labour market than the Bank currently thinks. In scenario 2, firms are currently working at a higher rate of capacity utilisation than the Bank estimates. In both scenarios monetary policy is endogenous. Inflation is higher in scenario 2, but monetary policy succeeds in getting it back to target by the middle of 2017. In scenario 1, inflation remains below target throughout the period. Now as a macroeconomist I really want to know more. These are different shocks, so they are not a pure test of asymmetry. The path of interest rates is not shown, so we do not know how much of a constraint the zero lower bound is (if at all) in scenario 1. In scenario 1 unemployment falls quite a lot more than in the central projection, but the additional GDP growth seems small by comparison. The opposite is true in scenario 2. This is undoubtedly a result of different shocks being applied, but all the report tells us is that judgement was used in deciding how to shock the model to best capture each scenario. As I am sure Tony Yates would say, it would be nice for those who are interested in this detail to know a bit more. However, putting all these qualifications aside, these simulations are welcome given all the discussion underway. They suggest that the upside risks to inflation are small, because monetary policy is capable of responding quickly. Overestimating the degree of current slack does not lead to inflation ‘taking off’. Perhaps this helps to explain why the Bank appears to some to be rather relaxed about the need to raise rates. Macroeconomics tells you to (temporarily) raise, not cut, government spending when we have a recession caused by deficient demand and interest rates are at their lower bound. That is the claim that some of us make. Others say we are being far too sure of ourselves and our subject, in part because there exist models where this is not true. As a result, we should not loudly complain when politicians do not follow this advice. A bit more humility please. If you think we should have more humility, imagine the following. The UK or US government tomorrow abolishes their independent central bank, and immediately raises rates to 5%, saying it was about time savers had a better deal. Well macroeconomists generally think that independent central banks are a good idea, and we nearly all believe that raising interest rates when inflation is below target and unemployment is high is crazy. But wait a minute. There are models that suggest keeping interest rates low is causing low inflation, and that raising rates could stimulate the economy - I discuss one here. So perhaps we should not be critical of a government that did this. We should be humble, and leave the politicians to do as they please while we get on with our research. Let us make sure we are absolutely sure before shouting too loud. Why is that wrong? Two reasons. First, the existence of a model that says higher interest rates could stimulate the economy is not in itself evidence that it might. In an interesting paper, Paul Pfleiderer talks about Chameleon models. He defines a chameleon model as “built on assumptions with dubious connections to the real world but nevertheless has conclusions that are uncritically (or not critically enough) applied to understanding our economy.” The model that I discussed where higher rates could stimulate the economy assumes (among other things) agents believe the inflation target is negative, and that raising rates will show them they are wrong. Possible, but highly improbable. Second, economic policy always takes place in an uncertain environment. Raising interest rates might have reduced inflation in the past, but maybe this time is different? If we wait until we are all absolutely sure about the impact of a policy change, we will wait forever. However, if we are more than 90% certain that raising interest rates, or cutting government spending, will make the recession worse, we should say so. If politicians ignore this advice, we should make sure everyone knows. This is no intellectual game - people’s welfare is at stake. For teachers and students of macroeconomics. I’m about to teach a small number of first year undergraduate students Keynesian macroeconomics, and my aim will be not to tell them that this is the macroeconomics of sticky prices. Yet I realise I’ve already gone wrong. In week one I talked about time periods in macro, and how the ‘short run’ was the length of time ‘it takes prices to fully adjust’. I must have been saying this for years. But it is at best highly misleading. The big danger in equating Keynesian economics with sticky prices is that students forget about the crucial role monetary policy is playing. Too many think that after an increase in aggregate demand, if contracts and menu costs were absent, higher prices would in themselves choke off the increase in aggregate demand. As they have just learnt micro, it is a natural mistake to make. They then get very confused when price flexibility does (at best) nothing at the zero lower bound. In my second year lectures, I ask my students to think about a monetary policy that involved moving real interest rates in response to the output gap, but not to excess inflation. If that policy stabilised a closed economy, then what impact would the speed of price adjustment have on anything except inflation? Inflation aside, a world where price adjustment was quick would look much like a world where prices were much stickier. The ‘short run’ would have the same length, irrespective of how quickly prices adjusted. All this is about how Keynesian economics is taught, rather than about how it is done. Yet how it is taught can also influence how it is eventually understood. One of the problems some people have with understanding that we are still in a situation of deficient demand is that it is five years after the recession ‘and surely prices should have adjusted by now’. There is also a rather more profound point. Many anti-Keynesians use this misunderstanding about price adjustment to dismiss Keynesian economics. When they say ‘I ignore Keynesian economics, because I think prices adjust rapidly’ they are really saying ‘I ignore Keynesian economics because I think monetary policy is very successful’. And in the real world, monetary policy can only be very successful by understanding Keynesian economics! Where I argue that mainstream economics should think about the methodology of their subject more, but that to study this methodology it is much better to look at what economists actually do than to look at their (occasional) writing on the subject. Methodology? Why should I worry about that? It’s what all those heterodox people do - lots of ‘isms’ and ‘ologies’ that are totally incomprehensible! Unlike those guys, I get on with doing real economics. After all, doctors do not spend large amounts of their time worrying about the methodology of medicine. So why should economists? This is a caricature, but not far off the mark for many economists. (When I refer to just economists/economics from now on, I mean mainstream.) Perhaps more of a concern is that very few economists write much about methodology. This would be understandable if economics was just like some other discipline where methodological discussion was routine. This is not the case. Economics is not like the physical sciences for well known reasons. Yet economics is not like most other social sciences either: it is highly deductive, highly abstractive (in the non-philosophical sense) and rarely holistic. This is all nicely expressed in the title of what I think is one of the best books written on economic methodology: Dan Hausman’s ‘The inexact and separate science of economics’. This is a long winded way of saying that the methodology used by economics is interesting because it is unusual. Yet, as I say, you will generally not find economists writing about methodology. One reason for this is the one implied by my opening paragraph: a feeling that the methodology being used is unproblematic, and therefore requires little discussion. I cannot help giving the example of macroeconomics to show that this view is quite wrong. The methodology of macroeconomics in the 1960s was heavily evidence based. Microeconomics was used to suggest aggregate relationships, but not to determine them. Consistency with the data (using some chosen set of econometric criteria) often governed what was or was not allowed in a parameterised (numerical) model, or even a theoretical model. It was a methodology that some interpreted as Popperian. The methodology of macroeconomics now is very different. Consistency with microeconomic theory governs what is in a DSGE model, and evidence plays a much more indirect role. Now I have only a limited knowledge of the philosophy of science, and have only published one paper on methodology, but I know enough to recognise this as an important methodological change. Yet I find many macroeconomists just assume that their methodology is unproblematic, because it is what everyone mainstream currently does. Even if we ignore these concerns, given the unfamiliarity of most economists with methodological discussion, it may be unwise to use what economists write about their discipline as evidence about what economists actually do. The classic example of an economist writing about methodology is Friedman’s Essays in Positive Economics. This puts forward an instrumentalist view: the idea that realism of assumptions do not matter, it is results that count. Economists do not think enough about their own methodology. This means economists are often not familiar with methodological discussion, which implies that using what they write on the subject as evidence about what they do can be misleading. Yet most methodological discussion of economics is (and should be) about what economists do, rather than what they think they do. That is why I find that the more interesting and accurate methodological writing on economics looks at the models and methods economists actually use, rather than relying on selected quotations. There is a nice self-conformational element to this post. Someone is bound to tell me that, in my comments on Freidman, I do not really understand what instrumentalism means. And that, of course, just goes to make my point that you should not rely on what economists say about their own methodology! Now, lest I be misunderstood, let me say three things before addressing Chris Giles’s charge. First, I’m pretty sure Chris is well short of 60. Second, Chris is no fool who blindly follows some party line: this piece on the Treasury’s exercise in dynamic scoring is as good as economic journalism gets. Third, central banks can suffer from what I and others prefer to describe as ‘groupthink’. Laurance Ball argued that this happened at the Fed when it came to not trying what I call forward commitment (promising higher inflation and a positive output gap in the future to combat the zero lower bound). Having said that, Chris can occasionally pursue a line that, while popular in some quarters, makes little macroeconomic sense. The idea that UK austerity did not matter much had him clash with not just the usual suspects (including me), but also US academics Alan Taylor and Oscar Jorda. (I discussed an earlier version of their paper here: their latest version is here). In a similar way, over the last few months Chris has relentlessly pursued the idea that UK interest rates should rise very soon. Chris’s charge against the Bank is that they keep moving the goalposts. For example, they say they will think about raising interest rates when unemployment dips below 7%, but when unemployment does go below 7% they decide that there is no reason to raise rates, and so on. But for the Bank the goalposts are the inflation target, and inflation is below target. In the past I have made the point that, given uncertainties about the size of the output gap, it is best to err on the side of expansionary policy. This is because the Bank can easily deal with inflation if it does begin to rise, but because of the lower bound the opposite is not true. Chris responds that “no one should expect that an overheating economy will quickly set prices and wages on the climb”. “As the pre-crisis period showed, economies can overheat and develop dangerous imbalances without displaying the usual warning sign of inflation.” He is of course talking about house prices. But raising rates is a very inefficient way of dealing with a housing boom, which is why we now have the Financial Policy Committee at the Bank with its macroprudential tools. It is also very inefficient for the Bank to be trying to undo effects caused by the Chancellor’s policies (Help to Buy). To see what can happen in this situation, we just need to look at Sweden. Sweden raised interest rates from almost zero to 2% beginning in 2010, because they were worried about overheating in the housing market. They now have deflation: inflation was -0.6% in March. As a result, the central bank has had to bring interest rates back down again. Lars Svensson, one of the world’s leading macroeconomists who resigned from their equivalent of the MPC while this happened, can only say I told you so. While we are on the subject of premature interest rate increases, let us not forget the ECB raising rates just before the second Eurozone recession. And let us not also forget that the MPC almost followed their lead - not much evidence of institutional dovishness there. I suspect and hope that the Bank and MPC have their eyes on the big picture. UK GDP per capita is currently around 15% below the level we might have expected it to be at if it had followed pre-recession trends. At no time since WWII has the economy not come back to this trend. We have no even half decent theories about why this trend should have dramatically changed. In these circumstances, starting to put on the brakes when we have only just begun to catch up lost ground, and when inflation is below target, just seems dumb and dangerous. As I wrote recently, the economic debate on the impact on austerity is over bar the details. Fiscal contraction when interest rates are at their zero lower bound is likely to have a significant negative impact on output. Of course the popular debate goes on, because of absurd claims that recovering from austerity somehow validates it. Next time you get a cold, celebrate, because you will feel good when it is over! Which means more articles like this will have to be written. An interesting question for an economist then becomes why austerity happened. There are some groups who have a clear self interest in promoting austerity: those who would like a smaller state, for example. While arguments for ‘less government’ are commonplace among the more affluent in the US, in Europe there is much less natural antagonism to government. As a result, as Jeremy Warner said, you can only really make serious inroads into the size of the state during an economic crisis. Large banks also have a direct interest in austerity, because they need low debt to make future bank bailouts credible, enabling them to carry on paying large bonuses from the implicit state subsidy that this creates. So, from a cynical point of view, for this and other reasons those close to finance will always talk up the danger of a debt funding crisis just around the corner. However there is a large middle ground who genuinely believes austerity was required to prevent the chance of a funding crisis, particularly after Greece. Yet Quantitative Easing (QE) fundamentally changes this. If the central bank makes it known that QE drastically reduces the chance of a debt funding panic, and anyway they have the means to offset its impact if it occurred, any contrary advice from the financial sector might be defused. The middle ground might be persuaded that fiscal stimulus is possible after all. Now this was never going to happen at the ECB. It takes every opportunity to promote austerity. It took two years of continuing crisis to get it to introduce OMT. I do not follow the US closely enough to know what, if anything, the Fed said about the impact of QE on the prospect of a bond market panic, but I do know Bernanke was not afraid to warn of the dangers of excessive austerity in his final days in charge of the Fed. Which brings us to the UK, and the coalition agreement of 2010. The Conservatives may well have advocated their austerity programme whatever the Bank of England had said: it was a golden opportunity to reduce the size of the state. However their coalition partners, the LibDems, had campaigned on a more gradual deficit reduction plan similar to Labour. Mervyn King’s advice during this period is often credited with helping persuade the LibDems to accept the Conservatives’ proposals. (See, for example, Neil Irwin, or for more detail Andrew Lydon). So why did King advocate austerity, rather than telling politicians that with QE in place, a funding crisis was both much less likely and less damaging. We may get a clue from something recently published by the Bank, as part of its stress test scenario for UK banks (HT Britmouse). The application is to 2014 rather than 2010, but it may still indicate what the Bank’s thinking might have been four years earlier. It talks about “concerns over the sustainability of debt positions” leading to a “sharp depreciation in sterling and a build-up of inflationary pressures in the UK.” As a result, monetary policy is tightened and long term interest rates rise - presumably because QE stops. In one of my first blog posts two and a half years ago I wrote that “austerity is not even a sensible precautionary policy when we have QE”. Does this scenario give me cause to doubt that verdict? It does not, for two reasons. First, what makes a funding crisis so scary when you cannot print your own currency is that it is a bit like being blown off a cliff. Once interest rates start rising because of fears of default, this in itself makes default more likely. We have a clear nonlinearity, such that it may become too late to retrieve the situation once the process begins, as periphery Eurozone countries found out. Depreciation in the exchange rate when rates are floating is not like that. The further the exchange rate falls, the more attractive the currency becomes, because trade in goods ties down the medium term level of the currency. The second reason why a loss of confidence in a currency is not like a debt financing crisis is that the former cannot force default, whereas the latter can. That makes all the difference. Without QE the markets have to worry about what others in the market think. The government may not intend to default, but if they cannot roll over their debt, they do not get that choice. With QE the government cannot run out of money, so the markets no longer need to worry about a self-fulfilling market imposed default. All that matters is what the government will do, and there was never any serious chance that the UK would default on its debt whoever won the election. However it is possible to see why the Bank might still have worried in 2010. Output had only just stabilised after the worst recession since WWII. They wanted to keep interest rates as low as possible to help a recovery. Yet inflation was more than 1% above target, partly as a result of the depreciation of 2008. The MPC believed their remit was to target 2% inflation two years ahead. If sterling had fallen further, they would have found it very difficult not to raise rates. Yet Mervyn King would not have wanted to go down in history as the Governor who raised rates during the depths of a recession. I think this says a lot about whether we had the appropriate monetary policy framework. (For further discussion of the economics see this post and links therein.) But my main point is this. It is all speculation, because as far as I am aware the Bank said very little officially. The Governor let his views be known in private, and publicly endorsed the government’s austerity plan after the election (much to the annoyance of some MPC members), but there was no open debate about the issues. The Bank could have initiated this debate, but chose not to. So when the next recession hits, and interest rates go to zero and budget deficits increase, will anything be different? The central bank is in a position to make it clear what the risks of a market panic really are when QE is in place - indeed you could say that it has a responsibility to do that. Or instead it can publically argue that it still has all the tools it needs to manage the economy, and advocate austerity in private. Mervyn King once said (pdf) “Central banks are often accused of being obsessed with inflation. This is untrue. If they are obsessed with anything, it is with fiscal policy.” Is this always going to be the case?